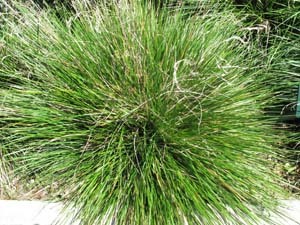 Tasmania has two native species of Deschampsia. D. cespitosa is a widespread species from damp places ranging from the margins of saltmarshes to the edges of alpine tarns, whereas D. gracillima is a tiny alpine species from the far south. Both species are perennials that form tussocks (often large in the case of D. cespitosa). The inflorescence is a loose panicle, the spikelets are smallish (~5mm) and have 2-3 hermaphrodite flowers. D. cespitosa has an awn attached to the back of each lemma, D. gracillima has a small awn at the end of each lemma.